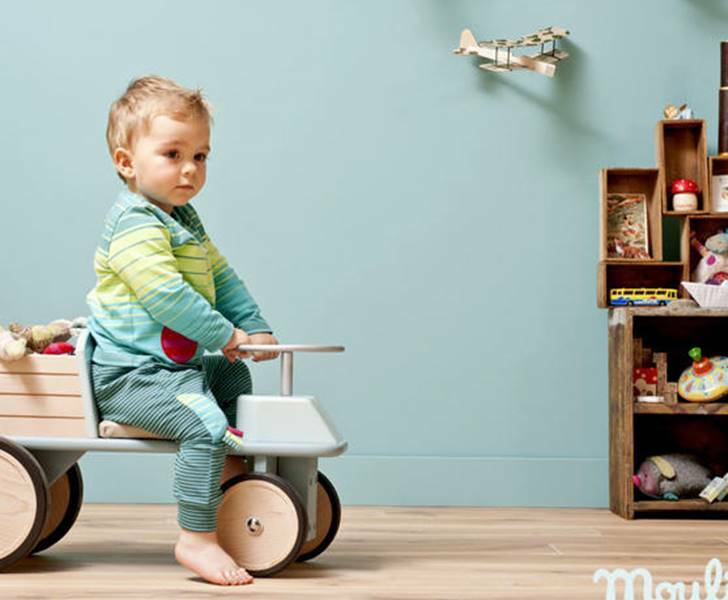 If you’re looking for a retro-inspired, heirloom designed ride-on toy for your young toddler, Moulin Roty has just what you need. Their lovely Ride On Wagon is a vision in retro blue, super fun and made to last for generations. On the wagon, a sweet silver coated metal steering wheel really turns the two front wheels and all the wheels are covered with rubber to protect floors. A wooden basket, perfect for carting around toys or books, completes this wagon. For more agriculturally minded tots, the equally wonderful Moulin Roty Ride On Tractor is a great choice and comes in retro red. Both toys are beautifully crafted with solid beech wood that comes from forests that are managed ecologically and finished with paints that are systematically tested and are non-toxic for tots. The heirloom quality of Moulin Roty toys means your child will be able to pass this toy on to a younger sibling, or maybe even their own child one day, which helps offset the somewhat steep price. If you're looking for a retro-inspired, heirloom designed ride-on toy for your young toddler, Moulin Roty has just what you need. Their lovely Ride On Wagon is a vision in retro blue, super fun and made to last for generations. On the wagon, a sweet silver coated metal steering wheel really turns the two front wheels and all the wheels are covered with rubber to protect floors. A wooden basket, perfect for carting around toys or books, completes this wagon. For more agriculturally minded tots, the equally wonderful Moulin Roty Ride On Tractor is a great choice and comes in retro red. Both toys are beautifully crafted with solid beech wood that comes from forests that are managed ecologically and finished with paints that are systematically tested and are non-toxic for tots. The heirloom quality of Moulin Roty toys means your child will be able to pass this toy on to a younger sibling, or maybe even their own child one day, which helps offset the somewhat steep price.